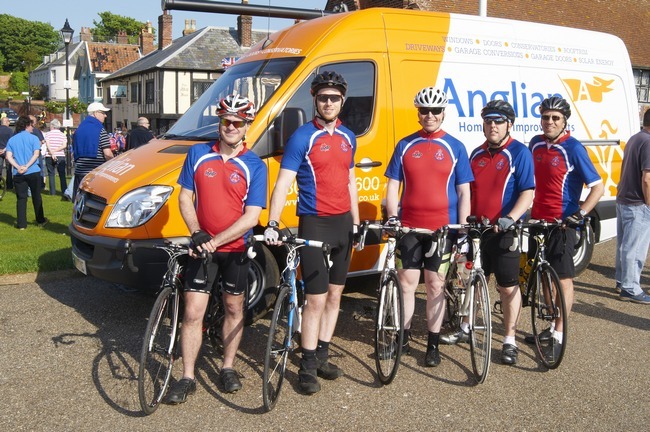 Today we have a guest post from Anglian’s James Wilson, who took part in the gruelling 400 mile journey from Aldeburgh to Borth for Bobby on a Bike, a group of volunteers who take part in cycling events, raising money for various charities. On this occasion they were raising money for the RNLI. Have a read of James’ experience of the 4 day ride and if you have any questions, leave a comment. Whichever way you look at it, this 400 mile coast to coast cycle trip is a winner. Now into its’ 10th year, it has become an exceptionally well organised 4 days riding along some of the most picturesque lanes in the UK. As solely a cycle ride, it is rewarding and challenging in equal measure. However, given the ride’s ability to raise many thousands of pounds for charity, the only losers are those who decide not to take part. There are some sacrifices; it would be naïve not to approach the 4 days without at least having spent several months building up stamina in the saddle. This means hours and hours of rides, not always in the nicest of weathers; an understanding family helps here too because they are the ones who won’t be seeing you at weekends. The one benefit of a very dry winter this year was the opportunity to train and only to have to contend with the cold. There is a level of trepidation for first-timers to the ride too, tales of epic climbs, meandering detours and loose farm dogs (all confirmed in the flesh). There’s a certain relief in getting started, whatever happens you’re in it for the finish and will have to cope with the obstacles along the way. The unexpected benefits are the extraordinary sense of camaraderie and privilege in taking part in such an event that could be regarded by some as a cycling holiday. Rather than it be viewed as a slog with the sole aim of getting from Aldeburgh to Aberystwyth. Indeed, if this was a ride advertised to the cycling masses it would be a sell out every year – there are people who do this sort of thing for fun! The riding, evenings and off-saddle moments brought out the best in taking 70 people and making a team over 4 days who you would be sad to part with after the trip home. 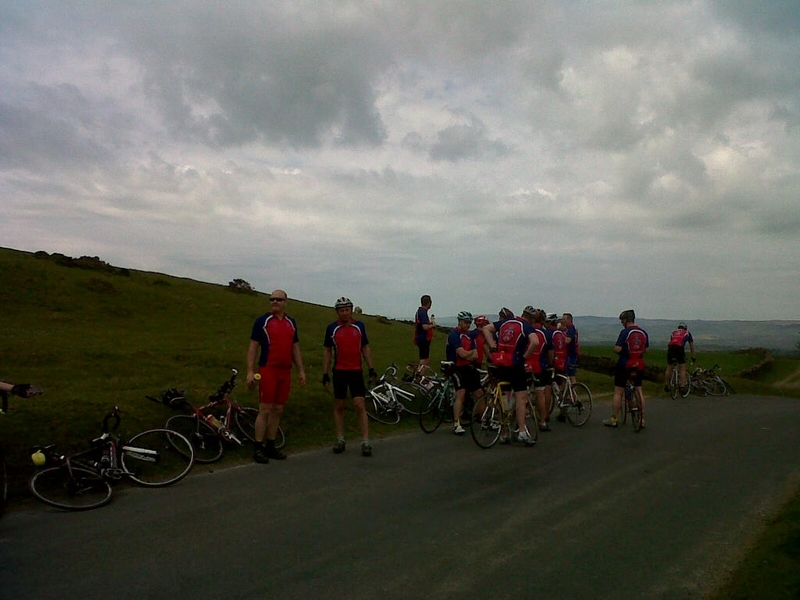 The full contingent of 53 riders inevitably broke into smaller groups, the largest of which was about 10. This happened quite naturally as individuals found a pace that suited – people ride at different speeds. This makes good sense from many perspectives – a group can support morally and in practical ways, but too large a group will have to stop every time one rider stops. Riding on your own can be demoralising and less easy to rescue if you encounter problems on the way. A very large group represents quite a challenge for the traffic on narrower roads. However, separate groups tended to end up congregating at various stages during the day – the feed stops and the tops of mountains typically. Suffice to say, no-one was ever too far away from a number of others. What really whets the appetite for me is the knowledge that every bike ride, even the shortest ones are always an adventure. The world outside is an indistinct blur seen from the wheel of a car, but a bike reveals the landscape, life, nature, smells and sounds. On the quieter roads there is the continual banter of fellow riders, and always details, views and vistas that might go unnoticed. No two bike rides are ever the same, one over a long distance is an overload for the senses. Notable points on this ride must include the spectacular views in Wales, the unstinting support crew who fed and watered us 4 times a day, the sight of the sea on day 4, the 14 50+mph descent on day 2, motorbike support riders guiding over the last few miles each day, being chased by dogs on day 2 and the first beer overlooking Borth. Spare a thought too for the 2 riders who managed the entire distance without sleep stops – starting at 5.00am one day, finishing 8.30pm the next. One question I keep getting asked – Could I sit down afterwards? Emphatically yes! It’s about the preparation..
What an adventure that sounds, a superb effort from all of those who took part. Some of those who took part this year have already signed up to do it again next year, which I think shows how well organised this event is; a credit to Neil Smith and all the other organisers who have made this a special event.